Receive confidential counselling for any challenge. This program is a professional and proactive service to support you, your spouse/partner, and eligible dependents(s) with a wide range of workplace, stress, and family issues and is available 24 hours a day, seven days a week, 365 days of the year. Even if you’re out of the country, help is still available. People frequently use it for personal challenges such as relationship concerns, family or parenting issues, anxiety, depression, addictions, grief, coping with health issues, or work-related challenges. Counselling – face-to-face, over the phone, video, or online (email or chat formats) counselling services for any challenge including family, depression, marital, life transitions/change, relationships, grief/bereavement, addictions, stress, anxiety, and other personal issues. 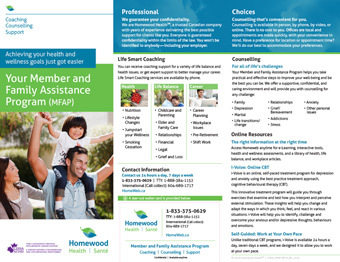 Life Smart Coaching – a suite of telephonic services that offers assessments, coaching, and resources for a variety of life balance and health issues. You can also receive legal guidance on a range of issues including family law, civil litigation, real estate, and wills and estates. Each service has been developed to allow you to take a proactive approach to managing everyday challenges. Online Resources – interactive tools, health and wellness assessments, child and elder care resource locators, and a library of health, life balance, and workplace articles. To access select resources, you will need to create a Homeweb account. CDHA Active (Practising), Support, and Life members are eligible for this benefit. 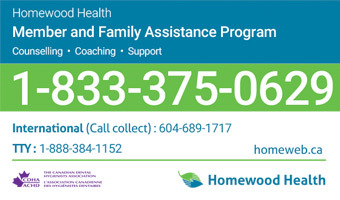 If you, your spouse/partner, or eligible dependent(s) call Homewood Health, you will need to provide basic information to confirm eligibility such as your name, CDHA member number, address, and organization (Canadian Dental Hygienists Association). You will also need to provide a few other key pieces of information to help determine the appropriate counsellor or service. All communication is confidential and private.